When we finally made our move up to a Class A motorhome, one of the things that we loved the most was the large front windshield. Since for us, a trip is about the journey and less about the destination, this larger front windsheild enables everybody to have a great view as we are traveling. 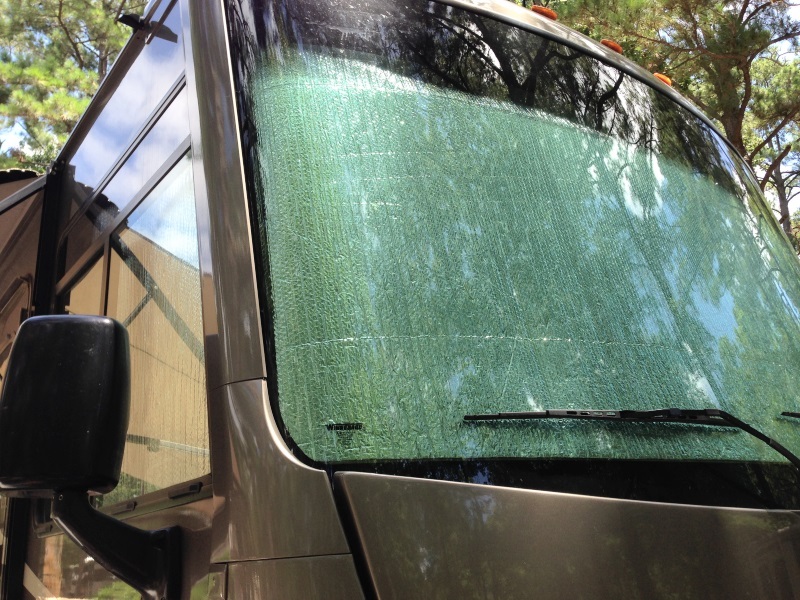 When we do get to our destination and setup camp, this large front windshield is a drawback. First of all, it allows for less privacy as our dogs can easily get on the large dash and open the curtain without our knowledge. Secondly, it lets in a lot of sunlight. We quickly found how difficult it was to keep the front of the coach cool even with both air conditioners running. I researched numerous products and there are a lot of good choices out there. However, most were out of our budget for some time. So I started looking around and came across the silver double reflective rolls of insulation with a small air bubble layer in between at our local home improvement store. I picked up a 4′ X 25′ roll for the budget friendly price of less than $50 after taxes. Once I got home with the roll, I started experimenting with how I could implement this. I took a rough measurement of my front windshield from inside and then added 10% to it. I cut a piece this long. Using a helper who held the center of it up level with the windshield, I placed some scrap 1″ high boards on the dashboard, then used a wax pencil to trace the curve of the bottom of the windshield as it came in contact with the dashboard. Well that wasn’t perfect but it was certainly close. So I removed the 1″ boards and traced the bottom of the windshield again, this time getting much closer. A few more adjustments and I was in business. My helper then held it up against the windshield while I trimmed the top to fit behind the curtain rail. Next I cut two pieces for the side windows. This was much easier as these windows are flat. I then trimmed them to that curtain hold backs would hold the insulation in place. Our dogs don’t like it as much but we enjoy the more comfortable temperatures. Tagged Do it yourself, RV Tips.